Agriform’s patented Gira & Gratta (“Twist & Grate” in Italian) is an all-in-one fresh Grana cheese grater. World renowned for their top quality Grana Padano, this Italian cheese cooperative’s innovative stay-fresh packaging preserves a 250gr, 16-month minimum aged block of Northern Italy’s famous cheese within an efficient, easy and always ready to use grater. Gira & Gratta prevents knuckle scratches, counter mess and waste from sharp, hard to clean stainless steel graters, and saves time and effort in the kitchen or at the table. Just twisting the cap of this practical device dispenses the perfect serving of sweet, savory and freshly grated DOP Grana. Excited shouts occur, usually, at this time, but do happen at all points of discovering the inventive convenience and sheer fun of the Gira & Gratta design. 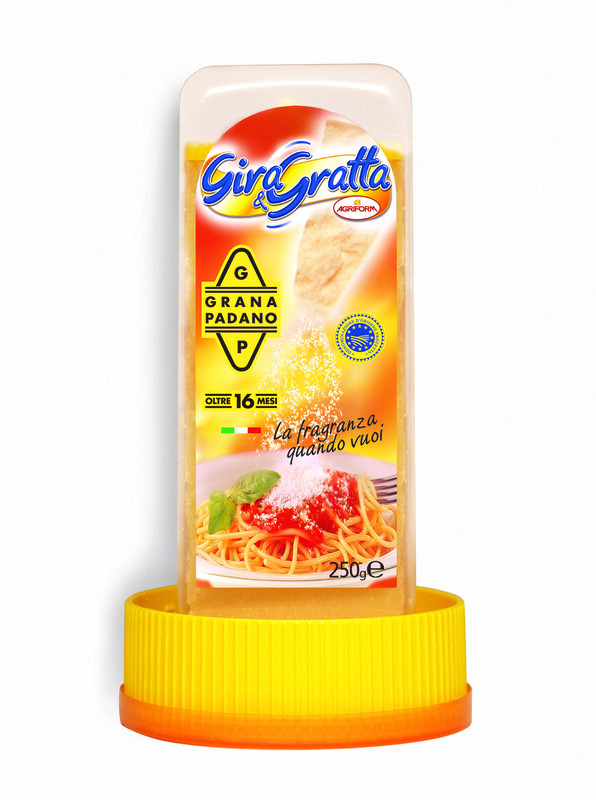 Application: Grate Grana over soups, stews, salads, pasta, rice, potato, meat and vegetable dishes – basically anything that calls for the delicately sweet and mild taste of Grana Padano. Use in the kitchen or at the table, or give Gira & Gratta as a much appreciated gift. Pairing: Can’t miss with a Chianti Classico or a Barbera d’Asti. Grana Padano complements and brings out the fruit in these classic Italian red wines. Spiga di Puglia Spaghetti is made from a traditional Southern Italian Puglia recipe with the highest quality Italian durum wheat. Amber in color, Spiga di Puglia Spaghetti increases in volume when cooked and retains it’s shape and texture due to an exclusive slow-process production method that results in a perfect al dente taste. All natural, rich with tradition, and superlative in quality, Spiga di Puglia Speghetti is made from the heart of Puglia culture. Copyright © 2013 Atalanta, All rights reserved.